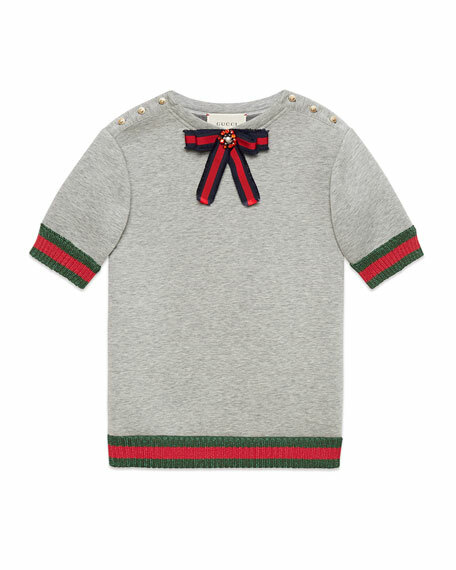 Gucci double-face cotton jersey shirtdress. Green/red/green web knit trim at short sleeve cuffs and hem. Blue/red/blue web bow at crew neckline with embellished center detail. Mother-of-pearl interlocking G's button along shoulders. 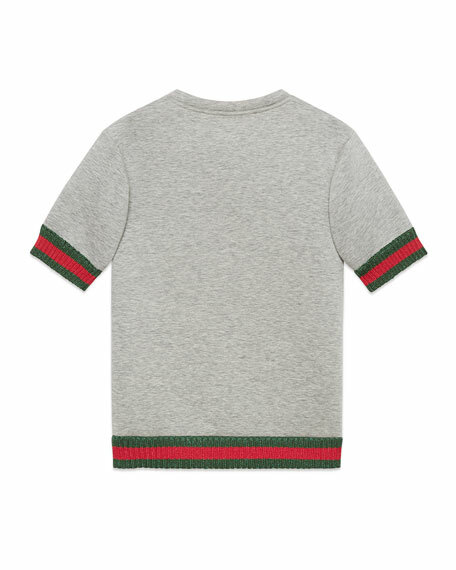 Gucci sweatshirt dress with logo taping down sleeves. Hooded collar; half zip front with ruffle placket. Long, raglan sleeves. Kangaroo pocket. Shift silhouette. Main: cotton. Trim: nylon. Made in Italy. Gucci silk dress with ruffle trim. Collared neckline; hidden front closure. Long sleeves with buttoned cuffs. Smocked waist. A-line silhouette. Gucci silk dress with ruffle trim. Collared neckline; hidden front closure. Long sleeves with buttoned cuffs. Smocked waist. A-line silhouette. Tiered, ruffle hem. Pullover style. Lining: cupro. Made in Italy. Gucci dress in assorted cartoon-style prints. Striped, rib knit spread collar. Sleeveless with contrast ribbed trim. Logo bow appliqu?? at mother-of-pearl button placket. Shirred, drop waist. A-line silhouette. Main: cotton/spandex. Trim: cotton/nylon. Made in Italy.